An internationally-renowned artist and pedagogue, Victor Danchenko graduated from the Moscow Conservatory where he studied with David Oistrakh. 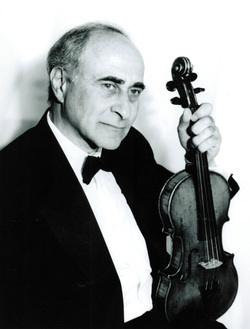 His numerous awards include the gold medal in the Soviet National Competition and the Ysaye Gold Medal. Also to his credit are recordings under the Melodiya label, as well as live radio and television broadcasts. Prior to his emigration to the West, he enjoyed a distinguished solo career, appearing with orchestras and in recitals throughout the U.S.S.R. and abroad. Since then, he has performed as a soloist in the United States, Canada, Europe, and South America to high critical acclaim while developing an immensely successful teaching career. His students have won major awards and competitions and appeared in concerts and recitals on all continents. Among his many successful students there are concertmasters of various orchestras, first violinists of major string quartets, members of major orchestras and various conservatories. Recognized as one of the leading teachers of today, he is currently on the faculty at the Curtis Institute of Music and the Peabody Conservatory of Music. In addition to these duties, he participates as a jury member of major international competitions. Mr. Danchenko also continues to conduct master classes in the USA, Canada, Japan, South America, Israel, and Europe, where he remains in great demand.